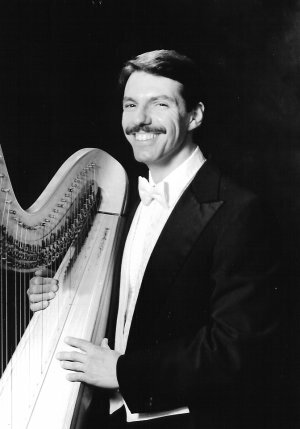 Dan Levitan, virtuoso solo harpist and orchestral harpist with three Bay Area orchestras is interested in sharing his music and talents with you. He is an experienced musician/performer with an extensive repertoire. Dan Levitan is the Principal Harpist for the San Jose Symphony Orchestra, Marin Symphony Orchestra, and the Fremont-Newark Philharmonic. He is the consummate professional, having also been a member of the San Francisco Symphony, the San Francisco Opera Orchestra, and the san Francisco Ballet Orchestra. His credentials, his honors are impressive; but, most important, Dan has immediate rapport with his audience. He is comfortable talking to his listeners about music he performs as well as encouraging audience participation. He relates to all ages, backgrounds, and those familiar or not familiar with the classics or contemporary favorites. You and your members will be enchanted with Dan and the magnificent sounds emanating from his golden harp.